Kids' Party Entertainments > Gregg Ka-Zam! Top international, award winning, magician! Gregg has performed in 6 countries and on television in Japan! The reviews say it all. Gregg is presently the best children's magician in the Dallas area. Hilarious, fast-moving show, with amazing magic tricks. This is a very family friendly magic show and no one gets embarrassed (except Gregg). 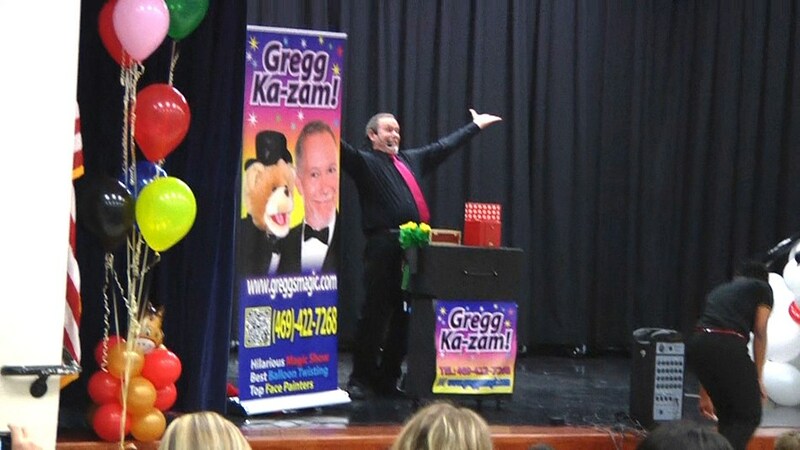 Gregg performs his fun show on stage for packed audiences, schools, libraries, city events, or right in your living room! The children will be clamoring to help out and if it's a birthday, the birthday child is the star! Adults love to watch the show as well, and you will see from the reviews, that they enjoy it as much as the kids. Gregg also does a hilarious adult show. Book early as his schedule fills up fast! Gregg also does balloon twisting and has a team of face painters and additional balloon twisters. Please visit the site for more videos, reviews and information. Gregg's professionalism is why I chose him over other vendors. I'd never used GigMasters before and didn't know what to expect. Gregg communicated clearly and was very thorough with all the details. We had Grand Opening events at 2 stores simultaneously. Face painters and Balloonists were top notch -- several of our employees were raving about their talent, as well as their interaction with the children. I will definitely call Gregg for my next event -- whether it's business OR for my son's birthday. Hire these folks, you won't be disappointed! He was professional, funny and very entertaining. The kids loved him and they laughed during the entire magic show. He arrived on time and set everything up quickly. I could not have been happier. We hired Gregg for an hour for our son's 1st birthday party. He entertained about 15 children, different age ranges. They loved the balloons he made and his magic show was quite fun! The adults were entertained as well! We'll definitely hire him again. Gregg was awesome! You can tell he has experience with children and parties. We were running a little late and he entertained guest as I finished setting up for the party. He was so professional, accomodating and patient. Gregg had many magic tricks and was a talented balloon twister. The party was for my one year old daughter so we had a few kids but mostly adult family attending. We all were impressed and had the best time. Thanks so much Greg for coming into my home and being such a nice person and a huge hit at my daughter;s first birthday. I couldn't have asked for better entertainment at such a resonable price! Excellent job! Gregg was just GREAT! He was so friendly, kind, professional, and ON TIME for our children's birthday party. He is so talented with making all types of balloons for kids AND his magic show had all the kids (of all ages) on the ends of their seats. He was great entertainment and I would highly recommend him to anyone having a child's birthday party. I was very impressed with Gregg and thought he did a great job. He was on time and wonderful with the kids. I would definitely recommend him. I was very pleased with "Gregg the balloon guy" performance, he was a joy to watch and he was not only entertaining to children but also the adults. He was very patients to even the most challenging child. His wife was wondrful at painting faces and the person that was over the games was awesome at keeping the children entertained once the show was over. I would definitly hire Gregg again if I needed too. He was prompt considering my address isn't easy. Thank you so much for such great service!!!? The Face Painter was absolutely AMAZING!! The party was a huge success!!! Thanks! The two balloon artists were extremely talented and accomodating. It was a pleasure to work with them. I was especcially impressed that one of them spoke Spanish and was able to truly bless our Spanish-speaking attendees. It was great to work with them. My ten year old kids had a great time!! Add facepainting to the magic show and get a $15 discount! Please note Gregg Ka-Zam! will also travel to Coppell, Irving, Lewisville, Grapevine, Richardson, Carrollton, Farmers Branch, Flower Mound, Addison, Euless, Southlake, Colleyville, Fort Worth, Bedford, Roanoke, The Coloney, Lake Dallas, Hurst, Plano, Arlington, Argyle, Grand Prairie, Denton, Keller, Little Elm, Frisco, Garland, Allen, Haslet, Justin.